Jungle Red Writers: Read booky! AND THE WINNER OF A COPY OF BARBARA ROSS'S CLAMMED UP: RobinPS! Robin knew all about the egg! HALLIE EPHRON: We have a baby in the family, and I have no doubt that my daughter picked her name in part because she grew up loving a character by the same name in a children's book, one of many books that she used chase us around the house waving and crying, "Read booky!" This new person in our lives has been cause for great celebration, cooing and ahing, and a provides welcome excuse to buy fresh copies of the books we loved to read to (and later with) our kids. "And now go to sleep," said Miss Clavell. Margaret Wise Brown's Goodnight Moon, the perfect poetry to fall asleep to. A. 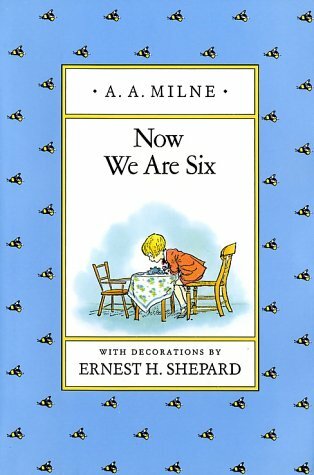 A. Milne's Now We Are Six is full of lovely rhymes for short attention spans. 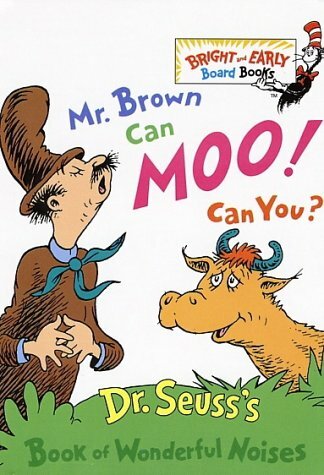 Dr. Seuss's Mr. Brown Can Moo! Can You? which I can also recite cover to cover. Mr. Brown is a wonder, he makes thunder! To make a noise like that. Is the poetry of beloved children's books lodged in your brain? What are your personal favorites to read to the little people in your life? And, there was an old woman who lived in a shoe. I'm probably just older than all of you. A baby in the family is wonderful indeed . . . .
and so many wonderful books to read! Anything Eric Carle [“The Very Hungry Caterpillar”] is always fun as is anything Bill Martin [“Chicka Chicka Boom Boom”and "Brown Bear, Brown Bear, What Do You See"] . . .
Over the hills and far aways. “Quack, quack, quack.” . . . .
Congratulations, Granny! I'm terribly jealous. Blueberries for Sal: "Kerplink, kerplank, kerplunk." Where the Wild Things Are: "And they roared their terrible roars and gnashed their terrible teeth and rolled their terrible eyes." Love You Forever: "I'll love you forever, I'll like you for always, as long as I'm living my baby you'll be." LOVE seeing these well-loved book covers. Besides the ones you've mentioned, two of my faves are the Olivia books and the Eloise books. Oh, Edith, this one brought tears to my eyes because, How true is that? Any version of the rhyme about too many monkeys in the bed. And Blueberries for Sal was a much-loved story book in our house too. My favorite Seuss, which I remember from MY childhood as well as my daughters? The immortal Horton. "He meant what he said and he said what he meant. An elephant is faithful, one hundred per cent." Triss: We sing "No more monkeys, jumpin' on the bed" to the baby now and we have a book with it, too. On Blueberries - I love love love all the books of Robert McCloskey -- though it's his illustrations that are mesmerizing. My favorite: "One Morning in Maine" about his daughter (he did write about his real kids and the house was theirs) losing her first tooth. I memorized "One Fish Two Fish" reading it to my little sister. My own children loved "Tikki Tikki Tembo No Sarembo Charri Barri Ruchi Pip Perri Pembo" (which I am sure I misspelled), "Piggy in the Puddle," "Caps for Sale," and "We Were Tired of Living in a House" (so we packed our bags . . . ). Oh, how I love babies (CONGRATULATIONS) and children's books. Love Tikki Tikki Tembo... (that's the little boy's NAME, and it means "The Most Wonderful Thing in the Whole Wide World") -- his little brother is named Chang ("Little or Nothing") ... got to dig out the book to remember the story. For the little ones in the family, I've already read How the Grinch Stole Christmas and Encyclopedia Brown (I work on the brainwashing early!). Once they're a bit older, I love to read The Secret Garden to them as well. Such fun. I think one learns one's language from poetry and nursery rhymes; I think one would learn a foreign language with much more ease if the first-year textbooks included them. My nieces and nephews enjoyed the Curious George books and all the Suess books. I love reading to kids, and I am ecstatic that my nephew's family recently moved back East from Nevada. I'll get to see their darling 17month old daughter more often than every six months! Now I get to spend hours in the kids' section of bookstores again, picking out books to read to her! When I would read to her father he would often want me to read the same book over again when I go to the end! 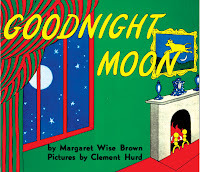 Good Night Moon was one of his favorites. One of my personal favorites to read to kids is The Snowy Day -kind of amusing, since I hate snow! I need to pull out from my memory bank the names of all the authors and books I read to my nieces and nephews, and to their parents, too, when they were little. Congratulations , Grandma Hallie, to you and Grandpa! I love so many of these examples, but hadn't read the Alfred Noyes poem. Lovely. And how could we leave out Robert Louis Stevenson? "How would you like to go up in a swing, up in a swing so high?" Deb Romano, I love A Snowy Day! And I meant to say, we read and reread many books by the English author and illustrator Shirley Hughes. If you're not familiar with these books, find them! Dogger was one of our favorites. And Alfie's Feet. Utterly charming. My very favorite book that I remember reading to my son when he was a little older than the Seuss book age (but not tons older) was Knots on a Counting Rope by Bill Martin Jr. It is the story of a young, blind Indian boy who asks his grandfather to recount the story of the night he was born. His grandfather does, in a way that strongly affirms the boy for how he came into the world and the courage he has shown since. The title refers to Grandfather's teaching that every time the boy hears the story, he must put a knot in the counting rope and when there is no more room on the rope, he will be able to tell the story for himself. It is poignant and lyrical and I LOVED it! when they were really little I read my three kids Mother Goose and A Child's Garden of Verses. My older daughter: Bread and Jam for Frances (her middle name is Frances), Babar, Madeleine. My younger daughter: Beatrix Potter books, Winnie-the-Pooh. My son loved the Maurice Sendak books, Paddington Bear. others: Lyle, Lyle Crocodile, The Little Engine That Could. All three loved Dr. Seuss. and how could I forget Curious George? My son loved his exploits. and Make Way For Ducklings (we lived in the Boston area when my girls were little. 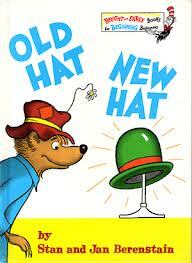 Anything written and illustrated by Bill Peet. My daughter loved his books and so did my grandson. Peet had worked as an illustrator for Walt Disney and his drawings for the books are super. And Hubert the Lion was due for a fall." For the older child, daughter and grandson loved "The Church Mouse" by Graham Oakley and the succeeding books in the series. A cat and a bunch of mice coexist in a church in England. In the first book they manage to foil a burglar. The illustrations are very detailed and amusing. One shows some of the mice, given the task of picking up confetti after a wedding, diving and playing around in a box half full of the stuff. There is some political satire in the books, which may go over the children's heads but makes the books more interesting to the adult doing the reading. 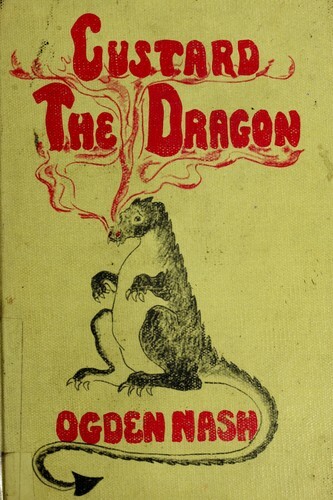 and The Reluctant Dragon, by Kenneth Grahame. Also liked The True Story of the Three Little Pigs by Jon Scieszka and Lane Smith and The Frog Prince, Continued by Jon Scieszka. If people go down to the end of the town, what can anyone do? And the cloak of invisibility! (KING: The cloak of invisibility didn't work! I kept bumping into things! Meecha at the bottom of the coconut tree! And does any one know Marsupial Sue? SO great. Along with all the old favorites, my granddaughter has loved Mo Willems Knuffle Bunny books as well as Edwina and Edward the Emu. My book group always showers new grandmother with children's books, so that she will have a supply to keep at her house for them. Jeffrey Marks: You have excellent taste! Ellen Kozak: Gorgeous. And I so agree, it's how you learn to cherish words. David, Hank, MANY MOONS is a favorite for me, too. The story, the wonderful illustrations. The idea that the princess could wear the moon around her neck because when it's high in the sky, if she raises her hand her fingernail covers it." Reminds me of reading about a lttle girl taking her first airplane ride. As the plane rose into the sky, she asked her mother, "When do we get small?" I don't know Marsupial Sue but I do know The Bunyip of Berkeley's Creek. It was my kids fave, and it turns out it's an Aussie classic. We, of course, got it at a yard sale. Sandra Gardner: Sigh, Bread and Jam for Frances! That's our daughter's little girl's name. Loved all of the Frances the badger books. Chompo Bars are nice to get. Chompo Bars taste better yet. Mazel tov to the newest family member, Hallie. May she live a long, happy and healthy life bringing only joy to her family. Pat the Bunny was a big baby fave, and Harold and the Purple Crayon, and so many others. But the most worn book in our house of zillions of them was a book of poems about food. The girls made their dad, especially, read them over and over again. He always read in comicly exaggerated voices and they adored the combination of their goofy dad and the silly, musical rhymes. I'm not at home right now, so can't tell you the name of it, but it was a compilation of Shel Silverstein, old English and Scottish nursery rhymes, and all kinds of other stuff. Very whimsically edited. The Silverstein one was about a girl who would not take the garbage out, and the consequences that ensued. We all giggled. Madeline was such a favourite of mine! I too spent time in a hospital and had a scar on my stomach--what self esteem this book gave me! then when I chose for myself it was Madeline and Bread and jam for Francis. as a mom I loved to read: Red is best (to honour my love of red shoes) and: chicka chicka boom boom for the rhythm and: Love you forever -- but I could rarely read this all the way through without sobbing! That's from Moo, Baa, La, La, La, one of Sandra Boynton's wonderful board books. It looks like your room has been lived in by pigs! This is from Phoebe Gilman's wonderful book, Jillian Jiggs. Edith and Hallie, The Munchkin and I went to a reading by Robert Munsch a few years ago. When he did "I'll love you forever" every mother in the room sang along with him and every child--including mine--cringed in his or her chair. Have either of you ever read Munsch's Giant or Waiting for the Thursday Boat? It's wonderful. God is a little black girl. I love Madeline. 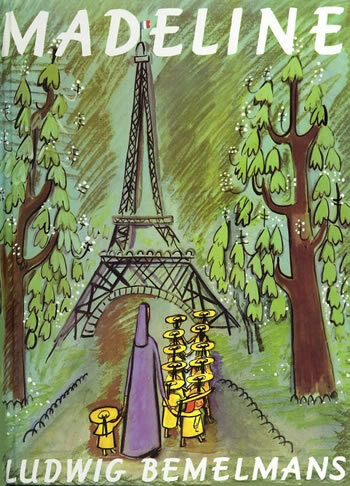 I sent Christmas cards with the twelve little girls in two straight lines beneath the Eiffel Tower that looked like a Christmas tree. I loved A CHILD'S GARDEN OF VERSES when I was young and liked to read them to my nieces when they were little. "I have a little shadow that goes in and out with me..."
It thrills me to see that my great nieces would rather sit down with a book that turn on the television. If you are ever in the Cincinnati area, there is a children's bookstore in nearby Ft. Thomas, Kentucky that has the Goodnight Moon room duplicated in almost every detail. It is really quite wonderful. PS - supposed to be "were" small. A bit tough to try to think w/a blasted migraine. You'd think boys would love this the most, but my girls thought it was hilarious. Of course, these are for older children, but Miss Frances will be an older child in the blink of an eye, I fear.